The Computational Intelligence Group belongs to the Department Artificial Intelligence. It is located in the buildings of the School of Computer Science, which belongs to the Universidad Politécnica de Madrid – UPM. The School is located on the Montegancedo Campus, which belongs to the UPM and it is situated within a residential area called Urbanización Montepríncipe, on the outskirts of a small residential town called Boadilla del Monte, about 7 km southwest of Madrid. In order to access the Campus, you can follow the instructions below. 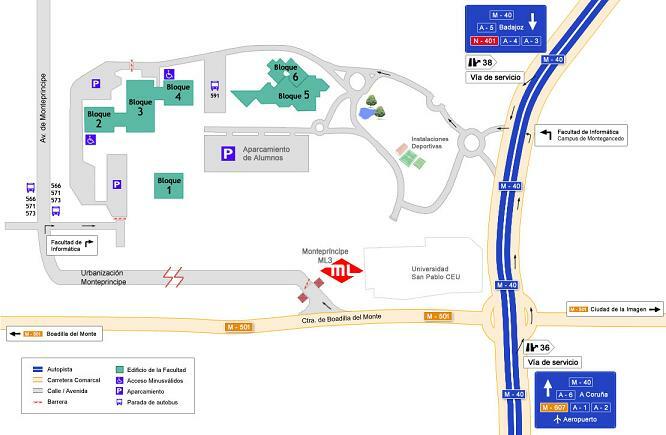 Once you enter Montegancedo Campus by taking the service road (exit 38 of the M-40 road), go on to the first exit at the first roundabout and continue straight ahead. At the end of the road you will find several buildings, one of them is white color and the other two are green. Our offices are located in the largest green building (Block 5). The secretariat of the Department is in office D–2202. The office numbers of the other members of the Department are available on their own web pages.